Antipasto is the first official stage of an Italian meal. As such, it is important, but that is where the need for decorum ends because you can be as ostentatious as you like in terms of what you serve. Alternatively you can take a more restrained approach. The choice is yours. It should be remembered, though, when considering items of antipasto that there are pasta, meat or fish, salad and dessert courses to follow so it won't pay to overload the guests before the proceedings have had a chance to warm up. In short, you want to stimulate their appetites rather than satisfy them. The term refers, not as is sometimes mistakenly stated as a course to be served before the pasta; rather the Italian word pasto translates as simply a meal, and thus antipasto can be defined in English as an appetiser. Roasting red peppers in the oven or directly on a gas burner before peeling them, letting them cool and serving them under oil or with a little balsamic vinegar is a light and colourful idea, while other vegetables such as artichoke hearts dressed in a little lemon juice and back pepper are popular. The same approach can be adopted for asparagus spears. These can be combined with some mozzarella, either sliced or purchased as bocconcini, or bite-sized, portions. Standard mozzarella is manufactured from cow's milk and is best utilised on pizza. For antipasto, cheese made using buffalo milk, referred to on the packaging in supermarkets or delicatessens as bufala, is a lighter, more delicate accompaniment to these vegetables. Buffalo mozzarella also works well with any one of the variety of cured meats that Italian producers export around the world. Salamis such as Milano and Napoli are widely available, as is bresaola. The latter is air-cured beef which originates from Valtellina in the region of Lombardy and is often complemented by parmesan shavings and the addition of either flat-leaf parsley or perhaps some peppery rocket. The undisputed king of cured meat is Parma ham, which hails from the province surrounding the northern city of the same name. The ham is cured by producers operating as part of a consortium to guarantee that traditional methods are used and that quality is assured. Parma ham is versatile and can, for example, work well wrapped around asparagus, but in truth it is best sampled very thinly sliced without accompaniment. Resist the temptation to remove the fat as it provides a sweet background taste to the salt of the meat. The use of bread should be sparing. 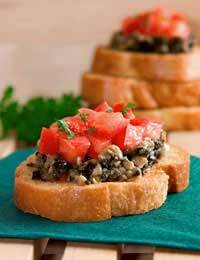 Confine it to some Roman bruschetta, rubbing the thickly cut toast with a garlic clove and drizzling some extra virgin olive oil over it before serving. The more ambitious may opt for some Tuscan crostini, using sliced and toasted white bread topped with some roasted peppers, sautéed mushrooms (preferably porcini for authenticity), spinach and ricotta with a dash of nutmeg, or chicken livers. In fact, whatever you fancy. Add the odd glass of sparkling prosecco to the proceedings and you have the perfect start to a memorable evening.